There is going to be an equine law seminar hosted by two attorneys on November 6, 2013. Attorney, Allison Eklund, reports, “. . . it’s oriented toward equine business owners or other non-lawyers interested in the basics of equine business law. It may be useful for lawyers to understand priorities in handling matters for equine professionals.” Ms. Eklund has been practicing law since 1998 and her firm currently focuses on equine public policy and equine business matters. As a registered lobbyist, she has been instrumental in the passage of legislation important to horse owners. The other speaker, Rebecca Bell, has been practicing law for nearly 25 years and works with equine owners and equine businesses. If you want to know more about your legal rights and responsibilities as a horse owner, breeder, trainer, or just want more information about selling your horse, purchasing a new horse, or how to legally operate your ranch or farm, you can attend online. The seminar is sponsored by the National Business Institute. For details, see www.nbi-sems.com or contact one of the lawyers at the links above. According to Rebecca Bell, an attorney knowledgable about equine law, “Leasing is a wonderful opportunity for a potential new owner to expose themselves to multiple horses before buying.” However, she suggests leasing should be approached with good, clear communication of the intentions of everyone and the agreement put in writing. The people entering into the lease need to consider the length of the lease, who will pay for farriers, veterinarians, training, nutrition, insurance, and all sorts of things. Her advice makes a lot of sense in that it can keep people from having hurt feelings in the end. A trail horse should transition to ranch work without so much as the twitch of an ear. A properly trained trail horse is quiet and calm. Ranch work and roping events should be second nature to a good trail horse. We like to take our horses to some of the local ranch roping events to test their training and make sure the quiet disposition remains in place with ropes swinging, cowboys singing, and calves setting back against the rope. Well, maybe not cowboys singing, but you get the picture. A calf at the end of your rope attached to your saddle horn will create some commotion if the horse hasn’t been taught to calmly accept things. Our friends at the Northeast Ranch Roping Association let us come and put our horses to work. The association promotes the reata-style roping with heavy emphasis on working livestock without a lot of stress. The old cowboy ways are the standard. A good horse and quick loop ready a calf or cow for vaccinations or treatment without a lot of stress. 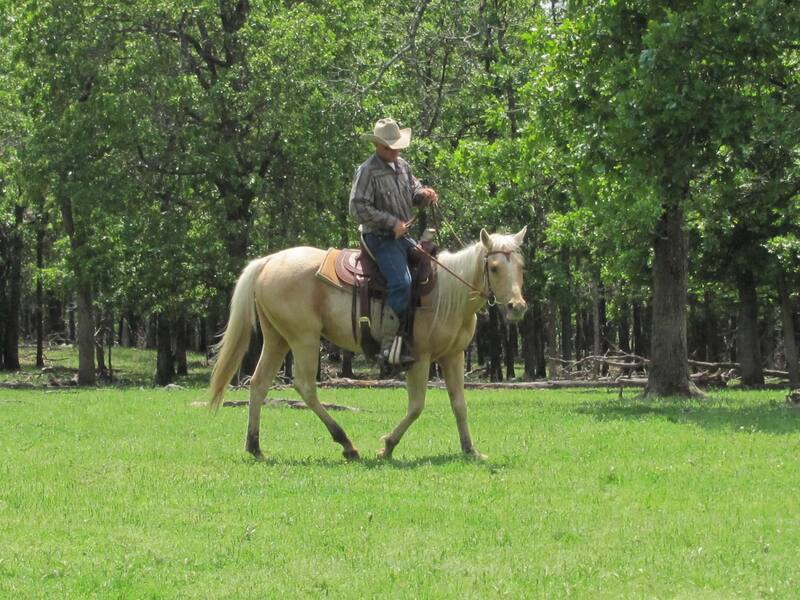 Ranch roping without heavy stress on the calves requires a well-broke horse. If you haven’t been to a ranch roping, you ought to come out to one. The next roping at the Northeast’s association is September 7, 2013. If you want more information, give Shawn a call 918-417-9250 and he can put you in touch with the members. Bet they would love to have you attend and show you how real cowboys work. According to AQHA Professional Horseman, Ken McNabb, collection is more important in a trail horse than almost any other. Generally, most people associate collection with dressage. McNabb is correct that a good trail horse needs to stop on a dime. You can find yourself in situations where you need the horse to stop immediately to avoid an accident or injury. Collection starts in the hindquarters as the horse learns to pull his legs underneath his belly. This is important for a trail horse because the “best brakes” on a horse come from the back feet, not the front. If you don’t believe this, see what happens when you bring a running horse that hasn’t learned collection to a fast stop using his front feet. As those front feet really start to dig in the ground, you will find your body coming up from the saddle. When this happens, be sure to give the horse a quick pat on the head as you fly over. Some people get the mistaken idea that collection starts at the bit and you train from the nose backward. This is entirely wrong. Just like McNabb, our horses are taught collection from early in their training and from the walk. The horse is asked to pull his hind legs under his body. It is a necessity when you need to back up a hill or back out of the mud. These movements are far easier if the collection has been underway over a long period of time and the muscles slowly acclimated to the movement. We concur with McNabb, a trail horse needs to stop on a dime to ensure the safety of the rider. He also needs to stop smoothly to keep the rider in the saddle. If you are working with your horse trying to get collection, be sure you remember to begin at the back and work your way to the front. You’ll be far more successful and your horse will appreciate the wear and tear on his mouth. A trail challenge has been set up in Talihina, Oklahoma in September, 2013. The challenge is an AHCA sanctioned event put on by Horsemen of Arkansas. It will be held at Horse Heaven Ranch. You must be a member of AHCA in order to compete. There is a 50% pay back award structure. For more information and details, call Meg Wills 501-940-2259 or Corry Key 479-567-6454 or go to the website http://www.horsemenofarkansas.org. If this competition is anything like the last one we attended, you will have a great time. The Horsemen of Arkansas have a bunch of wonderful members that make you feel right at home and welcome from the start. They offer all sorts of advice on the obstacles and the best way to compete. Since Oklahoma doesn’t have a local chapter, this is the perfect opportunity for you to take your horse and see how well you can do. We highly recommend it and hope to see you there! Chex, one of our AQHA quarter horse geldings in the two-year training program, is really coming along well. We have taken Chex for granted just a little and probably haven’t said enough about him. Chex is super quiet and relaxed. Although he has the “giddy up” if you want or need it, he takes everything in stride. He keeps his feet under him well in the rocks as well as in the mud. He has a good mind and willing attitude. 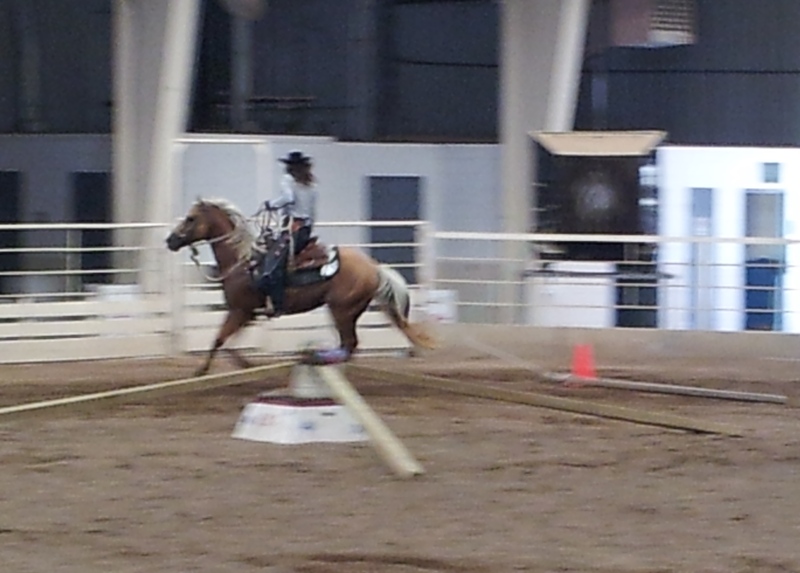 At the mid-point in the training program, Chex is being ridden by several different people. He is a real pleasure to trail ride. You can just set the auto-pilot and watch the scenery or enjoy some good conversation while Chex does the driving. If you want to steer, he neck reins and backs really well. Chex is a lot of fun right now and will be a spectacular trail horse upon his completion of his education. Some folks may ask, if he is doing so well, why not just graduate him now. We believe the second half of the training program at the ranch is the refining and testing that can only come over an extended period of time and a lot of hours in the saddle. Our customers are generally looking for horses that can do (and will do) nearly anything. The second year is devoted to reinforcing all the lessons with as giving as many experiences as we can create, imagine, or dream up. For instance, the we rode past a couple of trucks hauling hay along a dirt road with those hay trailers that hold 8 or 9 round bales. The old road was rough and full of holes. The trailers were empty so they banged and clanged loudly. A great experience for a trail horse just to ride about five feet from the trailer going down the road for a few minutes. These are the kinds of situations we use throughout the training. But, the second year is where you see the horse really began to use the confidence inspired in the first year and build up on it to the point that virtually nothing causes panic. The second year is also the time the horse is ridden much more extensively by multiple riders teaching him to accept cues that may not exactly replicate the initial training he received. A huge benefit for riders who haven’t spent the last 30 years in the saddle. Chex is headed for graduation in August, 2014, and receiving high marks so far. We predicted earlier this year that hay prices would settle to more reasonable levels. The last two years of drought has been hard for most types of agriculture in Oklahoma. Farmers and ranchers had some difficult years. Now everything looks a little greener (pun intended). Actually things look really green and nice. August this year has been spectacular with lots of rain and the grass in the pasture thriving. Hay prices have fallen back to reasonable again and will certainly benefit the equine industry. We are grateful for the much-needed rain with all the other blessings God gives us. Life is good! Sirens & Car Alarms; Are You Ready? We were pleased the other evening when one of those unexpected tests came. A couple of guests came to ride that didn’t have a lot of riding experience, beginner level riders. The horses were saddled, and of course we put the guests on two of our graduate horses to accommodate the experience level. Three of us were mounted on horses about 30 feet from the front of their truck waiting for the others. The truck alarm was accidentally set off when the remote control in the jeans pocket of one of our visitors was bumped. His truck has lights that flash, horns that honk, several different sirens that blare, and all of it very loud. It was one of those situations where we have seen wrecks happen with green broke horses and untrained riders. You may have seen some of those little rodeos where one of the horses goes to bucking that makes another suddenly jump sideways, while the next one takes off in a dead run. Riders go to falling off and everyone gets just a little excited. We were pleased that nothing like it happened and not a single horse so much as lifted his head. They stood quietly and turned as to say, “Is this another one of those silly tests you do all the time”? Aside from all the horses successfully passing, the best part was we never expected it. The perfect test for your horse is one neither of you know is coming. It was really nice to see the hard work and effort that has been put into the training of these animals pay off. It’s the way a good trail horse should react. One of the challenge course obstacles at the AHCA National Finals last week involved picking up the red bucket you see in the photograph while seated on your horse. Riders had to carry it full of water and sit it down on another barrel. The bucket event reminded me a lot of work we do here at the ranch. Many times we need a bucket of fence clips or nails and take them by horse to the work site. I can’t recall the number of times a bag of feed has been held in front of me on the saddle or behind me as I ride. I like to see ranch work simulations and events that replicate actual ranch chores. It means a ranch horse can compete in a trail challenge competition by just doing his everyday job. From my view these trail challenges are a lot of fun and let riders take pride in what they can do with their horse. If you want more information about AHCA, check out the web page: http://americanhorsemenchallenge.com/ or contact Jeff Lebbin at info@AHCAmail.com. Presently Oklahoma doesn’t have a chapter, but there is one in Arkansas. If you are interested in the Arkansas affiliate, contact Meg Wills at meg.wills@att.net. Will your horse lope over landscape timbers positioned in the shape of a star with one end above the ground. It’s called a pinwheel and a fairly common obstacle at trail challenge courses. Most of the riders we see keep their horse at a walk or maybe a trot. It is difficult for a horse to lope in a circle across the timbers without knocking down the beams. The photograph shows Wendy Stephens, one of the contestants at the AHCA National Finals. Wendy is a well-known horse trainer that conducts clinics on how to compete and win at trail challenges. While a horse can be taught to safely lope a pinwheel, it is not an activity without risk to your horse. We suggest walking at first and then moving to a trot once your horse understands the idea. The lope is fine for an accomplished rider and a good horse, but unnecessary for any place other than an obstacle course. While we respect the ability of trainers like Wendy to complete the obstacle properly, we have reservations about pinwheels as a trail challenge obstacle generally speaking. A good trail horse will never encounter a pinwheel on the trail and would never lope over it anyway. In our view, a properly trained trail horse is going to cross something new and unusual slowly and carefully. So pinwheels while offering a challenge don’t test a horse for attributes we believe important. However, we understand to an extent why the AHCA has to present obstacles to make the course a challenge to trainers and other professional horsemen. 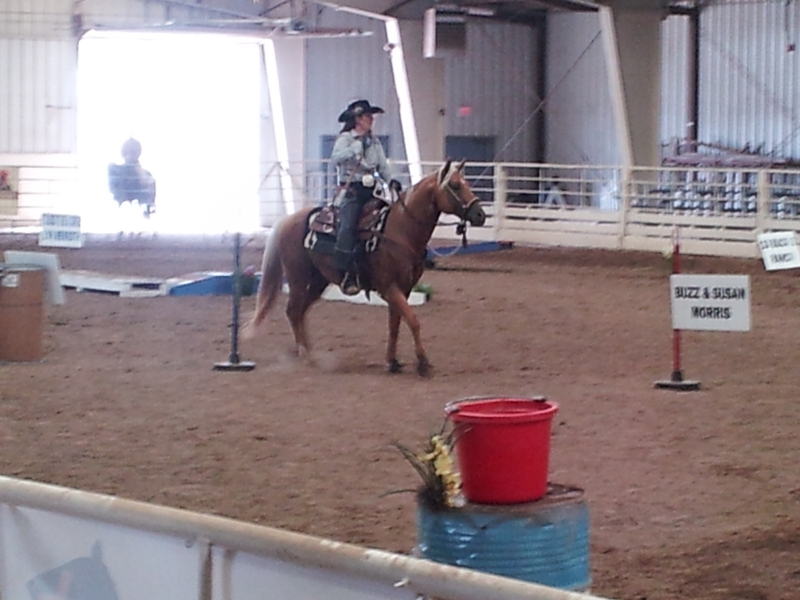 Wendy finished this class with the fastest time and the AQHA quarter horse she rode, “Shiner” did a fine job! You are currently browsing the horsesfortrail blog archives for August, 2013.